Summertime calls for vacation and going out to some of the best attractions close to you. For Californians like myself, Disneyland (and other California theme parks) are some of the most visited places by tourists and residents alike. With so much to see and visit, it can be intimidating to figure out what sustainable and zero waste options are available. Luckily, with the help of the internet and my friend who works at Disney, I was able to navigate the park with minimal waste. 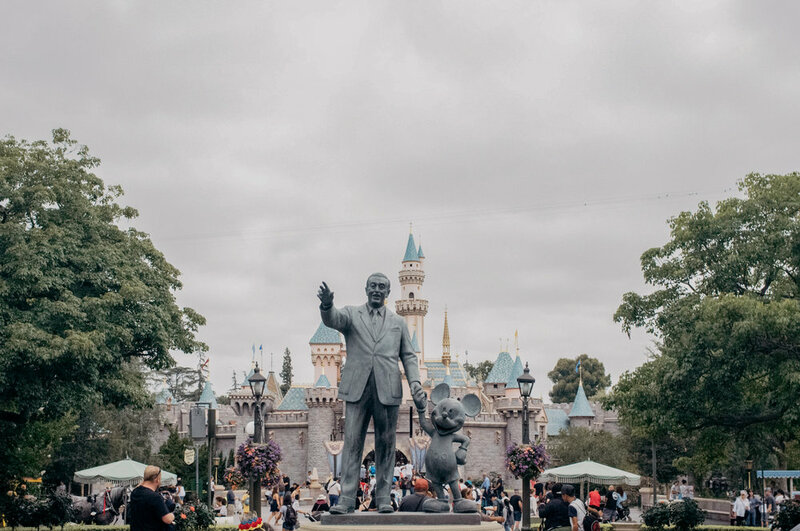 This post goes through the specifics at Disneyland, but many principles can be applied to any theme park you decide to visit! Before any trip to a large concert, venue or theme park, be sure to check what is NOT allowed. For example, many large venues, like Disneyland, do not allow glass, so no mason jars on this trip for me! I checked Disneyland's website here before visiting to make sure I wouldn't get anything confiscated. Nevertheless, I was still able to pack a few items and I tried to keep it light since I was walking the whole day. Please note that some of the linked items below are not exactly the same as the items in my pictures, but I tried to find some similar matches or products I would recommend. Water bottle - You can fill up at water fountains throughout the park, or fountain drink stations in some of the larger restaurants. Make sure to stay hydrated! Otherwise there are quite a few single use plastic water bottles which are sold throughout the park, but also recycling bins available. 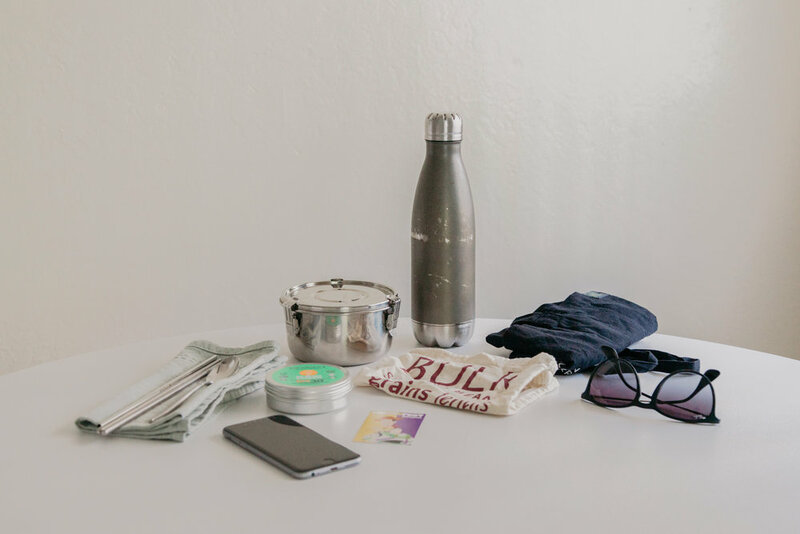 Napkin, reusable straw, utensils - Doesn't hurt to have these just in case to avoid disposables. I use items that I can already find in my household, but I've seen many people try out these lightweight bamboo cutlery sets. Stainless steel tiffin - For any leftovers or to carry your snacks. The security gate employee was a little suspicious of this metal tin, but bringing it into the park empty gave them a bit more peace. I scanned the food stands for desserts and snacks that were packaged in paper to avoid plastic waste. The paper could be composted. Sunglasses - These were usually on my head, but had to protect my eyes through the sunny day! Phone/Ticket - We paid $10 per person to get the MaxPass through the Disneyland app. This allowed us to breeze through the park with digital passes instead of having to visit each ride before and getting a physical paper pass. We could also get professional pictures taken at various places throughout the park. The Disneyland app was also extremely useful to check out what restaurants were available, etc. Would highly recommend!! It might also be helpful to bring an external battery for charging your phone through the long day. Cotton tote bag - Instead of my regular bag, I used a lightweight cotton tote bag to carry everything to keep things light. Bulk bag - I brought this in case I wanted to hold any dry food items. Sunscreen - I've been loving this sunscreen I purchased a few months ago. It comes in a recyclable tin and protected me during the sunny, hot day. Wallet - I realized I forgot this in my picture, but yes, don't forget to bring a little money for your trip if you need to buy anything! There are a fair amount of plant based and veggie options for those of you with any dietary restrictions. I found so many lists online which helped me to choose where I wanted to go, and I soon realized that I wanted Mickey shaped everything for the experience sake (since where else can you go in the world that serves Mickey shaped waffles?!). I ended up eating at the various restaurants throughout the resort which were decently priced, and many of the restaurants have durables, which you may want to check through Yelp beforehand. Was the food good? I would say it was alright, but I would also consider bringing my own snacks in next time. My favorite was definitely the Mickey shaped pretzel though. It was such a good snack! I had a wonderful time catching up with old friends and learning new things about the park from my friend who works at Disney. Did you know that Tomorrowland has edible foods and herbs planted throughout? It'd be awesome if we could strive to do that in our own communities in the future! I hope that you are all having a fantastic summer so far, or perhaps your summer is already coming to a close. Regardless, hopefully these are some tips that you can keep in mind for any upcoming trips you'll be having in the future, whether it's to Disneyland, another theme park, or adventure.